Desk PM is a blogging application. I talked about it here. It has come a long way since. It has now spawned two other related apps. It lets you publish to a wide mix of blogging engines. It lets you write in a WYSIWYG environment. It lets you write in markdown. Desk PM does everything, Desk MD dumps the WYSIWYG environment, and Desk NT dumps publishing. A cursory look at this table and a few things jump out at you. Blogo does more but only for 3 blogging platforms. MarsEdit is the older product in the category and its price reflects that. DeskPM is competitive in this marketplace. The critical differentiator in this market would be the environment provided by the products for you to write in. I have no experience with Blogo, so I would say that the leaders in this field are DeskPM and Byword. Byword was designed as a markdown based text editor for writing. The publishing function is an add-on to that capability. Byword has a full-screen mode and a line/paragraph focus which is industry leading. This is the market DeskPM is designed for. Its user experience and interface design is its main differentiator from Byword. They are both well designed products and you wouldn't be unhappy in either. Publish to Medium. This is a feature which has also been added to Ulysses, Blogo, and Byword. Implemented through the Medium API it lets you add posts to the drafts section in Medium. You use the Medium editor to clean it up and post. A welcome addition for folks who like posting to Medium. Tables. The table creation function only works in WYSIWYG mode. It needs to be better thought through. Why only WYSIWYG mode? I don’t want to work in that mode. I want to work in Markdown mode and should have access to the table editor in that mode. This switcheroo in modes doesn’t make sense to me. The table editor is also not fully developed. Once you create a table it is virtually impossible to add rows or columns to the table. The functions show up when you right click on the table, but they don't do anything. Seems to me that the feature has not been completely implemented. Desk PM's closest competitor Byword doesn't support tables. Typewriter Scrolling is a feature which is dear to me. I hate looking at the bottom of the screen when I am typing and this is a good implementation of the feature. Of course, if you are looking for typewriter scrolling, Ulysses is the best implementation of this feature. However, Desk PM's implementation is workable and a good addition to the writing environment. Desk PM still saves its files in a proprietary format, denoted by an extension .dpm. It is actually a package with the text file of your content and a settings file. The text file does contain your document, it has some screwy markup, but that is fixable if you need it. I would have preferred it if the application let me work in pure text files alone. It doesn't. It opens a markdown text file, it lets you add to it, but you cannot save the document as a markdown text file, you have to export it as a markdown file and the save function will ask you to make a new file with the .dpm extension. I use Ulysses and Sublime Text 3 to edit my text files. They all add features to my workflow, and I am not prepared to go all in with some proprietary format which is accessible by only one program. That is a deal breaker for me. I like the environment, like what it does with the publishing features, but I am not going to adopt a proprietary format for my work. So, if I am using Desk PM to publish, the process is always accompanied by writing in it and exporting the document periodically to markdown files. I work on the markdown files in other programs and then bring the content back to Desk PM. This is a pain. I have to maintain two versions of the same document and it adds unnecessary friction to the workflow. As you can tell from my feelings about proprietary formats, Desk PM currently doesn't figure in my workflow. It is a pity, because the writing environment is well designed. If you are willing to adopt Desk PM as your sole writing and publishing environment, this is not going to be as big a deal for you. Desk PM is a well designed writing and publishing solution and is recommended with reservations. Desk MD is a markdown editor without the WYSIWYG feature. It does away with the WYSIWYG mode and concentrates on Markdown. It is positioned as a markdown based blogging product. This is a product with a lot of promise hobbled by poor execution. Again, the proprietary format. It saves files with the .dpm extension. A markdown editor which doesn't save its files as markdown text files. Someone thought this was a good idea? 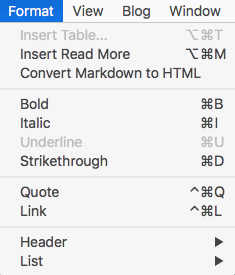 It lets you open markdown text files, but when you want to save it, it insists on the .dpm extension. Excuse me? The Desk family of products share the same codebase. But don't tease me. In Desk PM, tables are implemented in WYSIWYG mode. In Desk MD, there is no WYSIWYG mode, so tables are not available. But they show up as an inaccessible feature in the Format menu. It has the publishing features from Desk PM. So, you can write and publish in it. It is a nice environment to write in. But the product doesn't seem very well thought through. This is the category where there is a ton of competition in the marketplace. I could go old listing out all the markdown based text editors in the market, so, I am going to name just two. Two of the behemoths in the marketplace are iA Writer and Byword. You can argue about which is the best environment to write in for you, but they are both well designed alternatives which are playing in this space. So what makes Desk MD special in this space? I don't have a good answer to that question. Why would one adopt Desk MD instead of the competitors? I also don't have a good answer to that one. What could the developer do to make this product competitive? Ditch the dpm format. The dpm format makes sense for the WYSIWYG editor, since Desk MD doesn't support that, why is it burdened with the dpm format? If you are wedded to that format, give people an alternative to work in text files without the friction. Implement table editor right. Do it in markdown. None of the majors support tables at this point. Build in touches which make the product better at handling markdown. For instance, be innovative about links. Let me highlight a word and press a keyboard command to let the app know this is a link. Surround the word with square brackets, and copy the URL from the clipboard, surround it with brackets and place it after the square brackets. If there is no URL in the clipboard, place the cursor between the brackets waiting for the link to be typed in. Let me highlight a word, and press the left square bracket, surround the highlighted word with square brackets when I do that. You are making linking easier. 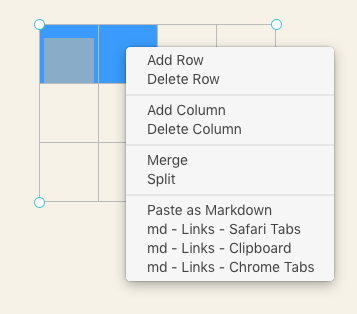 There are a ton of these features you can add which would make Desk MD a better markdown editor than the competition. Support all of a markdown variant. Pick one, Gruber's Markdown, Github Flavored Markdown, or CommonMark. Pick one. Support it fully. At this point in the product evolution, I cannot recommend Desk MD for anyone but those users of Desk PM who are irritated by its support of WYSIWYG mode. There are better markdown editors in the marketplace. I have no idea why this product exists. We live in a mobile world. Notes are documents we want to be accessible everywhere. Desk NT doesn't have an iOS equivalent, so notes you take in it are restricted to the Mac and the Desk NT application. There is no opportunity to add to the notes collection easily. You have to always have the application open and switch to it, to make your notes. No ability to be in one application and quickly jot down a note for Desk NT from that application. No quick entry option. It seems the developer took the Desk PM product, stripped out the publishing and called it Desk NT, and is trying to sell that as a note-taking solution. I don't see how this is better than any of the other available options for taking notes. The developer of a very successful product Desk PM now has three products in the marketplace, two of which are badly designed and ill-conceived. This is what the developer says about the product proliferation decision: "With version 2.0 I’ve segmented the original award-winning app into three distinct products, based on community and customer feedback!" Product mix decisions should never be based on customer feedback. The customers you have are already using Desk PM, they have no idea what the market would be for a markdown based pubishing solution or a note-taking app. They will express an opinion, specially if you ask them to, but it is by definition an ill-informed opinion. You should ignore them. Simple rule: Listen to them when they talk about Desk PM, ignore everything else. What is the relevant criteria for deciding on a line extension like this one? Does it make sense to the brand? You were trying to position Desk PM as a write and publish solution. Now you have Desk NT, which is a write only solution. Does it take away from your write and publish position? I think it does. This is a bad idea. Do you have the resources to support line extensions? You have a product Desk MD which doesn't do tables, but the menu item exists. You have started supporting tables but the contextual menu drop-down has items which cannot be selected. You do not have the resources to support three products. Desk PM in its first version was distinguished by attention to detail. It had features missing, but the ones it did have were well thought through and implemented. Version 2.1 is a mess. You do not have the resources to support three products. This was a bad decision. Are you going to be competitive in the new categories you are entering with the line extensions? Your competitive advantage is user experience with Desk PM. The folks who like Desk PM have already given you their money. They are not going to buy Desk MD or Desk NT. They get all the benefits of those products in Desk PM. So, you are talking about new users. User experience is a feature relevant to the user who has already bought your product. New users have no idea how they will feel using a product they have never used. So, it is a feature which is difficult to make salient to the prospective user. Looking at the markdown editor marketplace and the notetaking marketplace, these are crowded with a plethora of choices. How are you going to get heard in that space? How are you going to distinguish yourself in that space? Why are you picking that fight? This is a really bad idea. Focus. You are an independent. You need to focus on one product. Even if you were not an independent, I would give you the same advice. Focus on one product. Make it the best product in the marketplace. Churn like hell in that marketplace. When consumers think of blogging and the Mac, the only name on their minds should be Desk PM. Don't let anything distract you from that task. That marketplace has a lot of charm. Fewer competitors and a lot of users. It is a specialized task. You can be innovative and market leading in that category. You had a good start with version 1.0 of the product. Make it count. You want a new challenge? Make an iOS version of Desk PM. Write and publish from any device, anywhere. Don't look at ancillary markets and drool. My product can also be a markdown editor, there are so many more people buying markdown editors than blogging tools, let us go to that market. I am going to take my product, strip out the non-essentials and then I can be competitive in that market. No, you won't. The people in the marketplace making markdown editors are focussed on making the best markdown editor they can make. Your markdown product is a stripped down version of a market leading product in another category. You are not competitive. Don't waste your time. Dump Desk NT. Give the purchasers their money back. Have Desk PM do WYSIWYG. That is the only product which needs to use the .dpm format. Go whole hog. Support WYSIWYG fully in it. Write and publish. Have Desk MD do markdown. Pick a flavor of markdown and support it fully. Support text files. No .dpm file support. Go whole hog on the markdown support. Again, write and publish. What does this do? It gets rid of the confusion. Gives your products a much cleaner focus. Lets you own "write and publish". Makes you competitive. In the meantime, Desk PM is recommended with reservations. Avoid Desk MD and Desk NT. Note: I purchased Desk PM. Review codes were provided by the developer for Desk MD and Desk NT. Of course, after this I will not be surprised if developers refuse to issue me review codes. Note: Arm & Hammer Cat Litter is a brand extension. Arm & Hammer Advance White toothpaste is a line extension. When you go to a different category it is a brand extension. When you are playing in the same category with a different variation, it is a line extension. So, Desk MD and Desk NT are line extensions of Desk PM. If the developer made a weather app, called Desk Weather, that would be a brand extension.